Located by the ocean and set on a private white sand beach. This Hadahaa resort is within walking distance of Hadahaa Beach. Situated near the beach in Vaadhoo, this guesthouse is in the same region as Maguhdhuvva Beach and Maguhdhuvva Port. Ayada was ABSOLUTELY fabulous. Our family had the best time, ever. We have been fortunate to stay at some nice resorts all over the world, including in Bora Bora, but Ayada was just special. Impeccable personalized service. Right from Male to departure, they have someone to help you and treat you special at every step. Everything has been thought out. Its like their management has walked through their customers shoes and understand and anticipate what guests will need. We stayed for five nights at sunset overwater suite and it was paradise on earth. 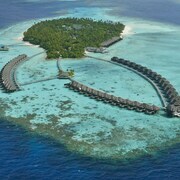 I am not sure that I will stay in Garden view villas but ocean villas might be fine too. Walkways are just so well kept and manicured. Food was awesome with lots of options and varieties. I am very picky with my dietary choices and Ayada accomodated my our needs every day and with a smile. Nest beach is out of the world. Zero degree pool, bar and beach is gorgeous. Only drawback- Ayada is too far from Male and takes several hours to get there- one hour flight from Male and then one hour speed boat ride. Wish, there was a seaplane option straight to the resort. I will highly recommend this place. Expensive but well worth it, lifetime experience and memories. Will love to visit again. We were assign to a member of the staff who coordinated our visit. Sharaf was thoughtful and immediately made is feel welcome. The system in the Maldives made us feel like cherished guest. We had escorts through each step and everyone of them were kind and gracious. I loved our pool villa which was a lovely room and location— very private. Bathroom was great on all count including the private outdoor shower. Being steps away from the beach was fantastic. The food, particularly the fish was delicious. We liked how small the maximum number guest at one time could be because the island was never congested. We went on a snorkeling trip with Alec who was very knowledgeable and compassionate to newbies. My husband is anxious about open water and Alec put him at ease, so my husband jumped in because Alec helped him find the confidence. It was the highlight of the trip. Please keep in mind, everything has to be imported a long way, so going to Maldives is an expensive proposition, particularly the food. But their generous and well timed breakfast (included) made us not need lunch. Their oatmeal porridge is the best!!! If you’re planning to go on the cheap, go somewhere else, but I didn’t regret a single dollar we spent at the Hyatt and I would happily do it again. Visitors to Maguhdhuvaa are sure to enjoy the restaurants. Tourists can also enjoy the city's coral reefs and spas. There are 5 hotels and other accommodation options in the surrounding area.